Unexpected news of the delightful kind! Wow! 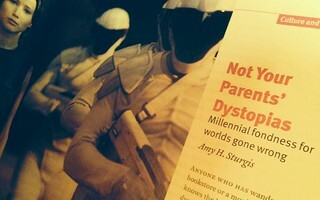 My article from the October 2014 issue of Reason Magazine, "Not Your Parents' Dystopias: Millennial fondness for worlds gone wrong," is a finalist for the L.A. Press Club's 2015 Journalism Award in the category of Magazine - Review/Criticism/Column. I'm honored! Congratulations to all who were nominated, especially the awesome folks at Reason - including my fellow finalist, the great Jesse Walker! wow, indeed! That's wonderful. Even though it's always an honor to be nom'd, may you bring home the shiny trophy! Congrats!!!! I've only read a few YA dystopian books. I gave them a try, but found myself usually unable to relate to the protagonists. They're young, and, at least in the ones I read, not all that bright. Things only happen because the person makes some really stupid decisions. Is that part of that generation's lack of training in self reliance and critical thinking? The "reduced ambitions" you noted in your article? And perhaps that's a big part as to why they find these types of books are so compelling to the young. If the world has fallen apart, you don't have to go out and get a job or find your own place to live. Usually, there are plenty of empty houses to squat in, and going through the difficult and back breaking chore of growing food is rarely addressed. There are still plenty of cans lying around. So congrats on the nomination. Your article is really interesting, and I'm rooting for you to win! I've only read a few YA dystopian books. I gave them a try, but found myself usually unable to relate to the protagonists. They're young, and, at least in the ones I read, not all that bright. Ugh, it sounds like you've come across some poorly done YA dystopias, and goodness knows there's enough of them out there. I quite like good ones, and I still find a one here or there among the "jumping on the bandwagon" wannabes. The latest that's impressed me is the Red Rising trilogy - the third book will be out next year - by Pierce Brown. It's clear he knows his genre history, too, which may be why his novels are so much better than a lot of the others: he's read and seen what works and what doesn't, and he's building on that. Things only happen because the person makes some really stupid decisions. Is that part of that generation's lack of training in self reliance and critical thinking? The "reduced ambitions" you noted in your article? That certainly may be the case. It also sounds like there's some bad writing involved! If the world has fallen apart, you don't have to go out and get a job or find your own place to live. Usually, there are plenty of empty houses to squat in, and going through the difficult and back breaking chore of growing food is rarely addressed. There are still plenty of cans lying around. That's a great point! Yes, I think you're quite right. There's no longer the challenge of deciding what path you want to take or living up to your potential or making something out of your life. It's survival on the remains of the past, and the litmus test for whether or not you're a success is as simple as life/death. The ones who are "doing it right" are still alive, period. I really appreciate your thoughts on this - and the fact you took time to read the article! Thanks for being awesome. Thanks so much! :D Your icon has put a huge smile on my face. I always had a fondness for dystopian books growing up. I rely on you in large part in navigating this new YA boom. Your analysis and insight are always illuminating.